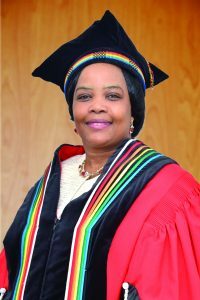 Professor Busi Ncama joined the University of KwaZulu-Natal in 1996 as a tutor in the department of Nursing. She obtained a BCur degree from Unisa in 1996, and obtained an MCur degree in 2000 from the University of Natal, in 2001 she completed a SAIM programme in Business Administration from UNISA, and in 2005 graduated with a PHD in Health Sciences from University of KwaZulu-Natal. She is currently completing a dissertation for the Masters in Business Administration, with all course work completed. She practised as a critical care nurse and later moved into the area of HIV and Aids. Professor Ncama served as Deputy Head of School and Postgraduate Coordinator in the School of Nursing and later an Acting Head of School of Nursing. She is also a committee member of Women in Leadership and Leverage (WILL). She was a Y Rated (Promising Young Researcher) NRF researcher in 2008. She received a Fogarty International Postdoctoral Fellowship which was tenured at Caprisa in 2005. In 2007 she received the University of KwaZulu-Natal Distinguished Teachers Award. She has been a recipient of research funds from NRF, MRC, and other funders. International Honour Society for Nurses and UCSF International HIV/ Aids network and has collaborated with researchers from other countries in HIV and Aids research. She has taught in other countries such as United Arab Emirates as UKZN assignments and developed HIV/ AIDS Nursing Curricula for use in East Africa. She has successfully supervised postgraduate students, and has published and presented papers at a number of national and international conferences.